Ever wanted to play Quidditch in real life? Well, now you can! 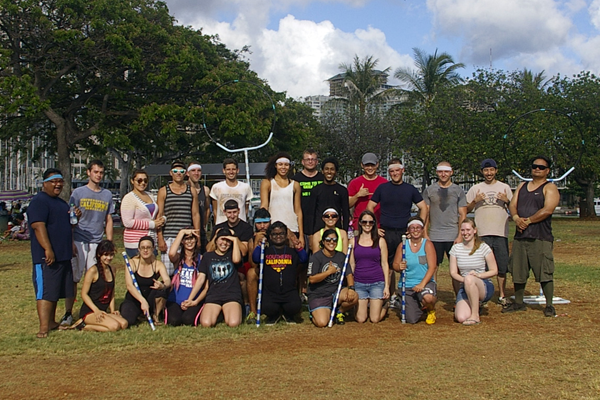 The Nightmarchers (Hawaii’s first Quidditch team) is looking for new recruits like you to join our nerdy and athletic ranks! Taking a page from the brilliant mind of J.K. Rowling’s iconic Harry Potter book series, we are a part of a non-profit organization known as the USQ (United States Quidditch). Founded in 2010, the USQ consists of over 4,000 athletes on almost 200 teams nationwide! Quidditch is a full-contact, co-ed sport that gets the heart pumping, and is fun to boot! Be a part of a great community that is friendly, proud to be nerdy, and competitive. Quidditch will bring you awesome friends and good memories for years to come! So come check out our panel, get sorted into your favorite Hogwarts House, and have some fun with us!